During our Great Divide tour in Canada and the USA I tried a Fat Bike and decided they would be really good for touring on gravel roads because they feel so secure to ride. On returning to the UK I researched different makes. I wanted one that had the same ride position and handling qualities of our trusty Thorn XXPs. Surly frames were the easiest to obtain in the UK and their Moonlander has very similar geometry ( head angle, seat tube angle and top tube length) to our Thorns. Everything starts with the frame. 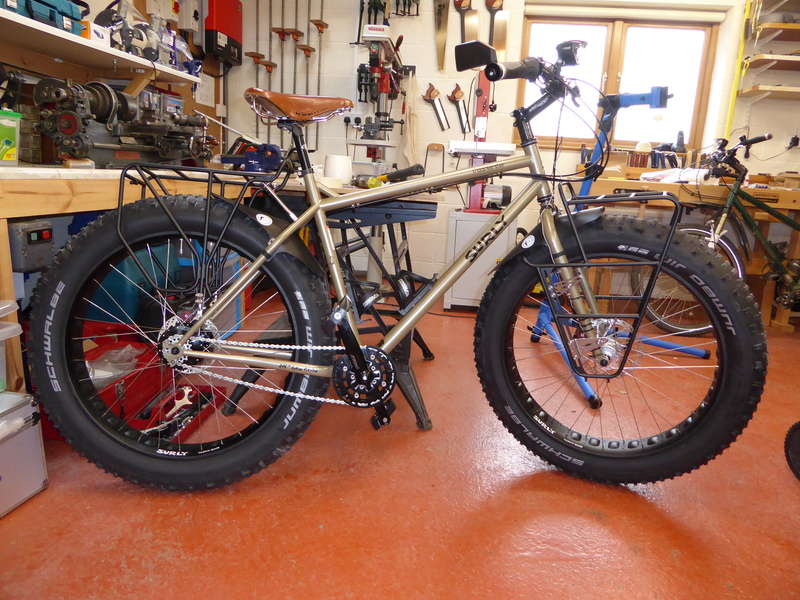 The Surly Moonlander frame has offset rear forks a choice of offset or non-offset front forks. I chose the non-offset as it makes for an easier wheel build. Building the wheels. 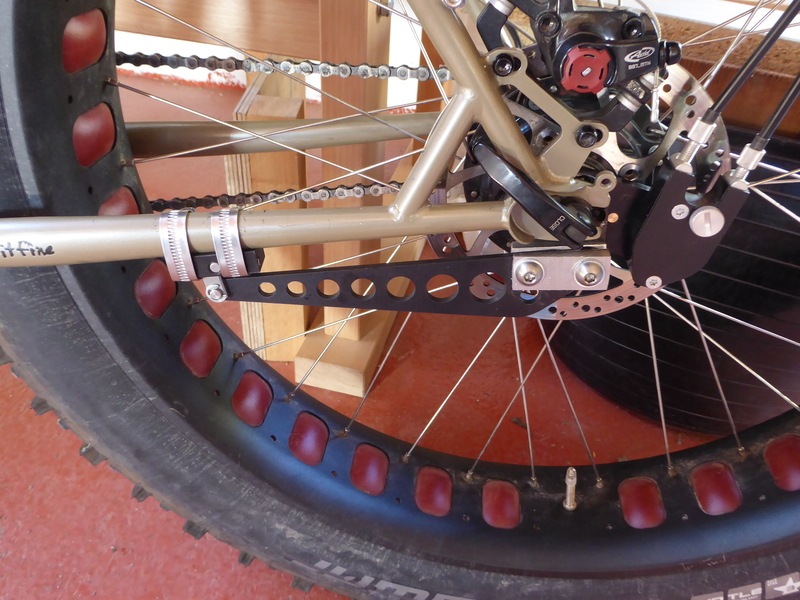 I have a Park Tools wheel jig and you will need the extension arms to accommodate the fat bike axle width. 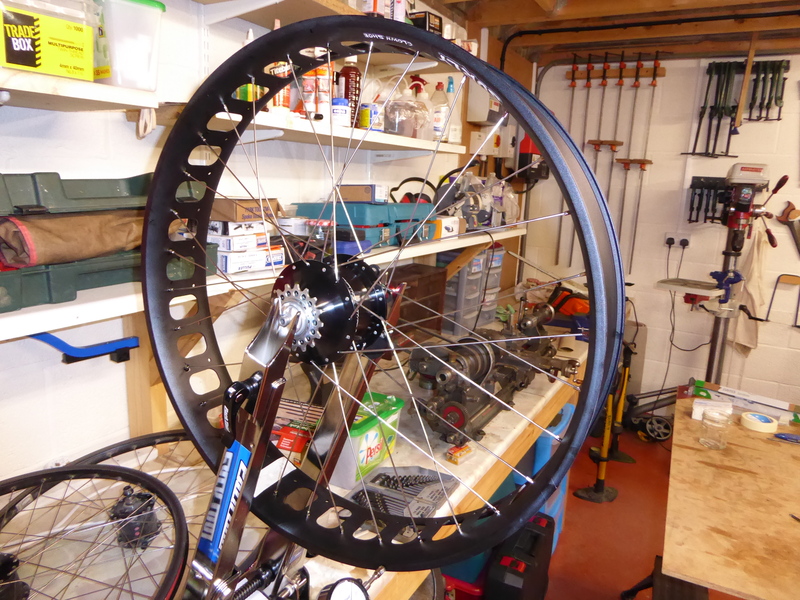 I bought the excellent e-book by Roger Musson “Wheel Building” 6th Ed. 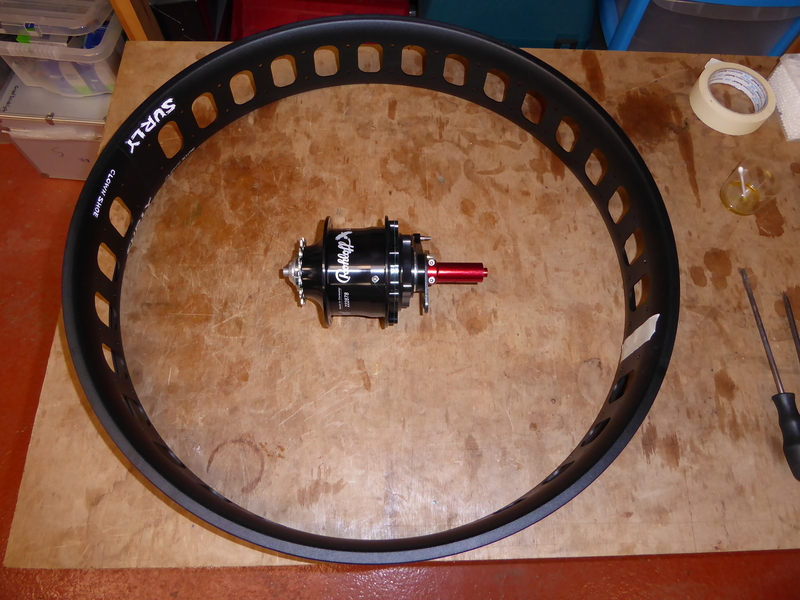 http://www.wheelpro.co.uk/wheelbuilding/book.php. I also used the free spoke length calculator Spocalc.xls. I bought Suly Clownshoe 100 mm rims. 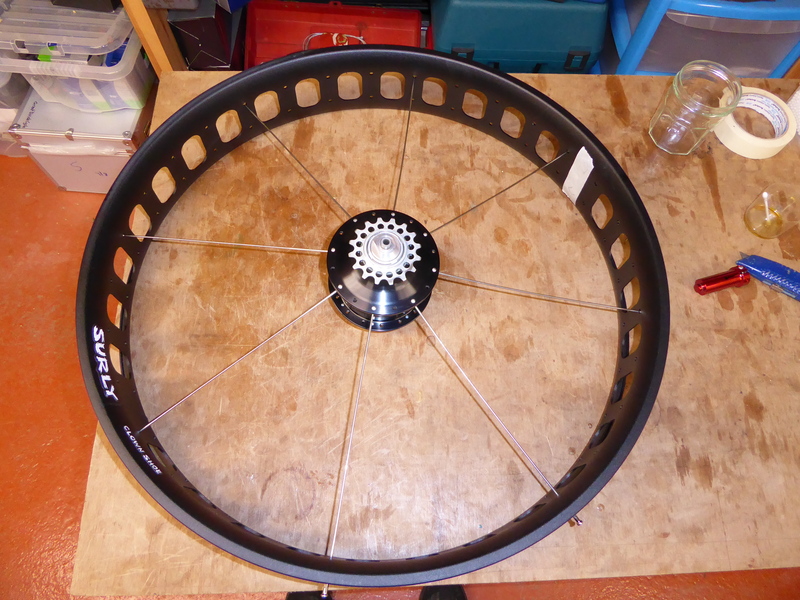 These have two sets of 64 spoke holes 40 mm apart so you can either build a symmetrical wheel as I have for the front or an offset wheel as I have for the rear. Front hub is the Schmitt Son 28 135 mm, disc brake axle. Just follow the lacing instructions in the book remembering to only use alternate holes in each side. 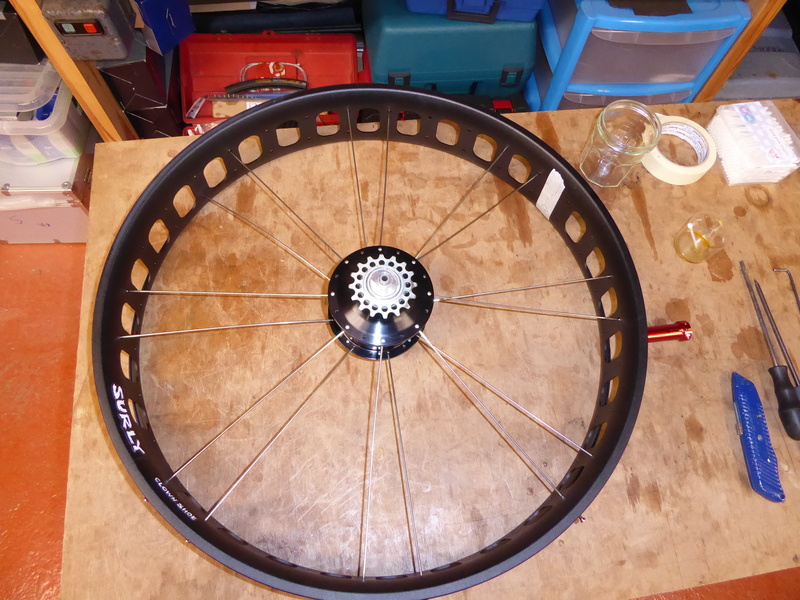 I used a free Excel sheet named Spocalc.xls to calculate the length of the spokes I needed. The front wheel is 3 cross. 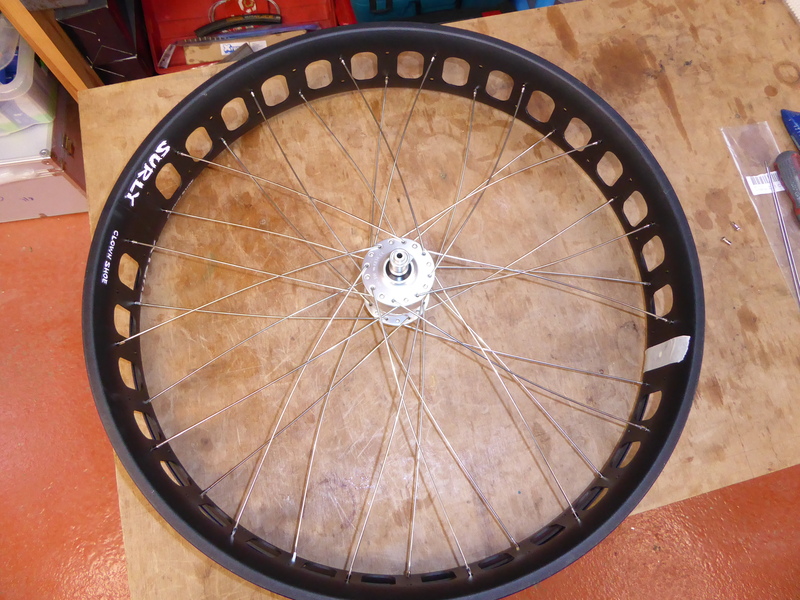 There is no Offset Spoke Bed but you have to allow for the fact the spoke holes are 20 mm from the rim centre. The calculator gave 257.9 mm. 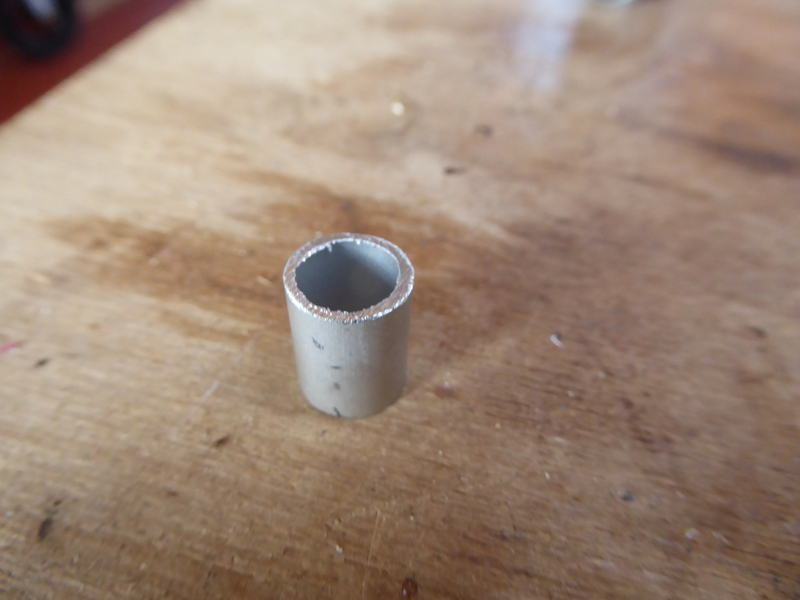 I used Double Butted DT Swiss Competition 2 mm ends 1.8 mm centre. The rear wheel is more complicated because the frame offset of 35 mm. 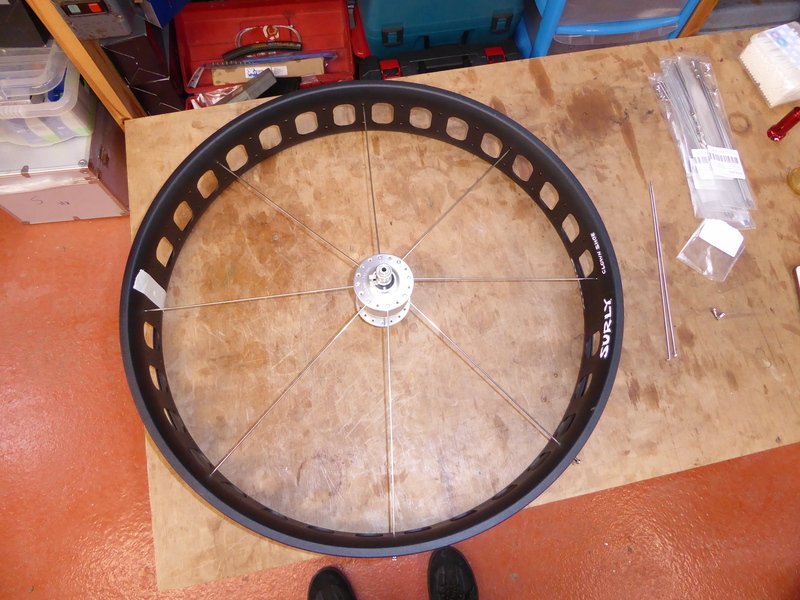 The frame comes with a spacer for building the rear wheel I measured mine was 35.4 mm. The combination of 35/2 – 20/2 = 7.5 mm is the resulting OSB. 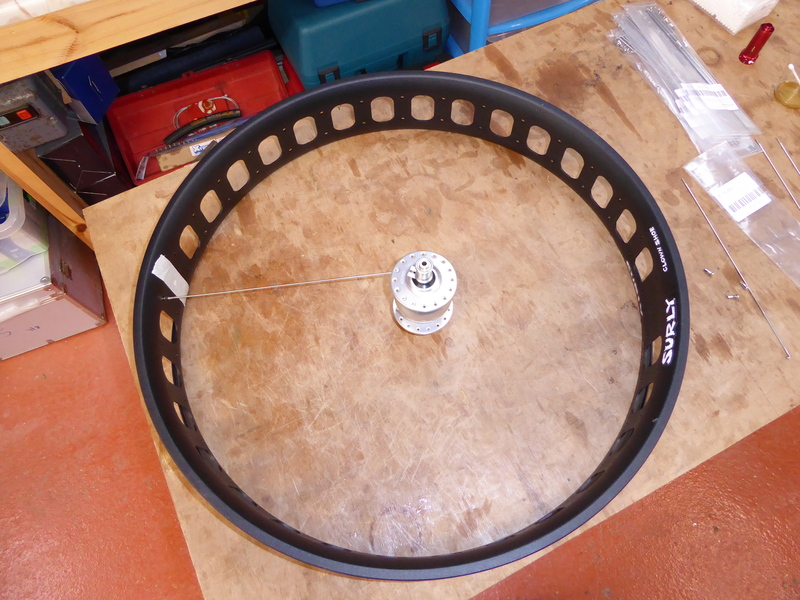 And because of the large diameter of the Rohloff hub it is 2 cross. 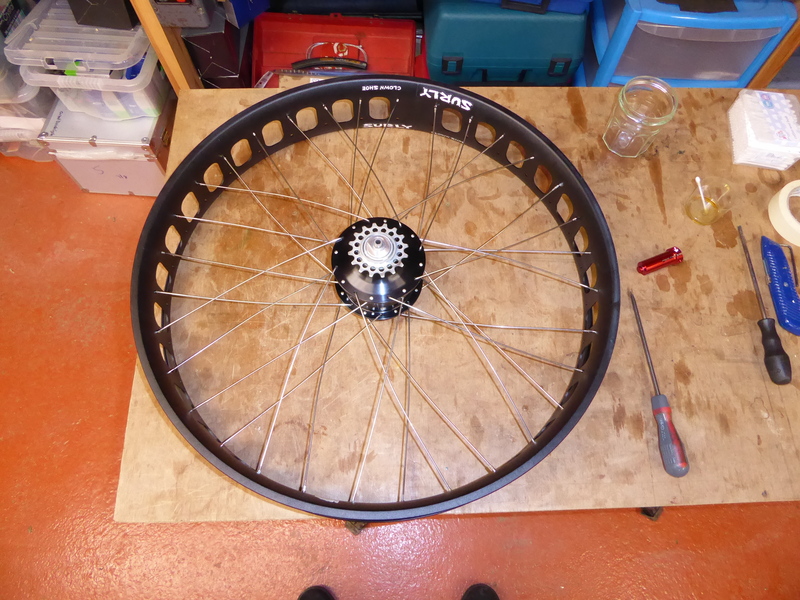 Giving 238 mm and 241.2 mm as the spoke lengths for the rear. I bought and used 238 and 242 which worked but if I was to build another I would use 238 and 240. Note that all 32 spokes go into one side of the rim. 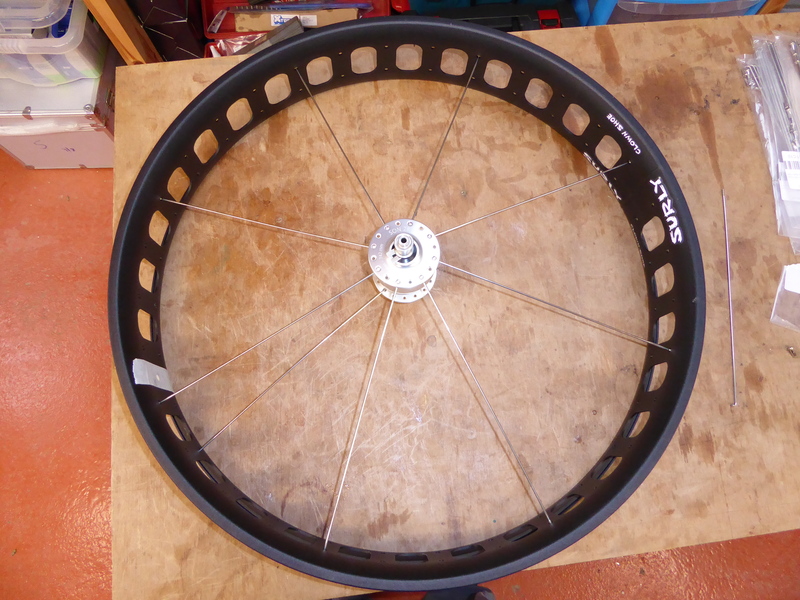 The Hub is the Rohloff OEM2 Disc. I fitted Schwalbe 26 x 4.8 ” tyres. 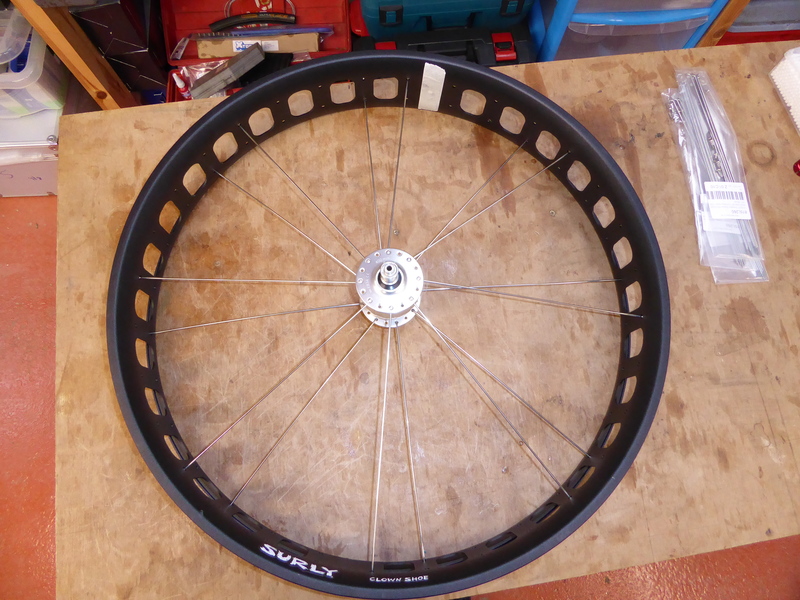 I wanted the Surly Knard as they have a close tread pattern that should be better on tarmac for touring but I could not get them in the UK. I bought the moonlander crankset which comes with a bottom bracket Although it comes with two front sprockets only one is used with the Rohloff. The large sprocket is a 36t and was fine for riding unloaded or for bike packing but for fully loaded touring that we do (I carry 26 kg of luggage and food) I found the gearing too high so I changed them for the 33t which allows me to ride up the steep Devon hills. After our ride to the Scottish isles (see our blog) The bearings in the bottom bracket all seized solid so I replaced them with my favorite Hope Ceramic versions. I fitted Cane Creek 40mm headset, 120 mm 17 Deg stem, Thorn comfort handle bars, Avid BB7 brakes. I bought the old Rohloff grip changers as I have found the new version supplied “the Wave” becomes so slippery in the wet you cannot use it without gloves. Surly racks which have to be gently bent to fit over the large tyres. The rear one also ends up being offset because of the frame offset but it all works and I have not had any loading problems with them. 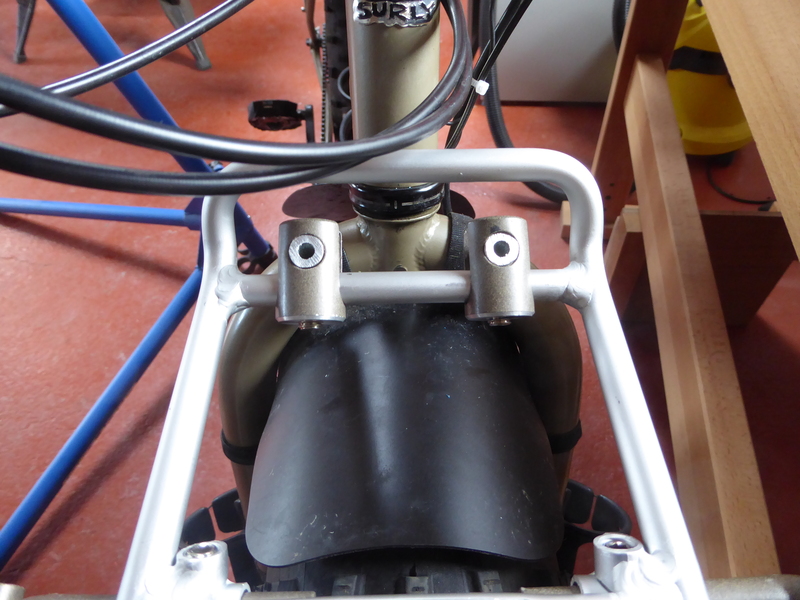 I fitted the Mucky Nutz mudguards to the front and rear forks initially then later added another fork one to the rear pannier and a down tube one. 4.8″ tyres throw a lot of mud and water! Thorn seat stem and Brooks B17 imperial saddles. My wife also finds these B17 Imperial saddles the most comfortable having tried many options. Rear – Cateye TL-LD 1100 ( I think these are now obsolete but they work well and give plenty of light most of the time we only use 5 LEDs but in daylight fog 10 LEDs get you seen. Front – I used to use the Schmitt Edelux and a separate USB charger but I was enticed away to the new Busch and Muller Lumotec IO2 Luxos U senso. I put two on my Thorns for our Great Divide ride and then bought two more for the Fatbikes. They are great lights and the USB charger works well. However I have had to have 3 of the 4 replaced because of water ingress into the switch which condensates and causes the lights to switch on and off at random on a 5 to 15 second cycle and there is nothing you can do to turn the lights either on or off. Whilst you can dry them out sometimes two days riding in the rain sets them in to failure again. Busch and Muller have replaced them with out question but also without any comment on the failure. The jury is still out as I haven’t had the replacements long enough to prove if they have fixed the problem. 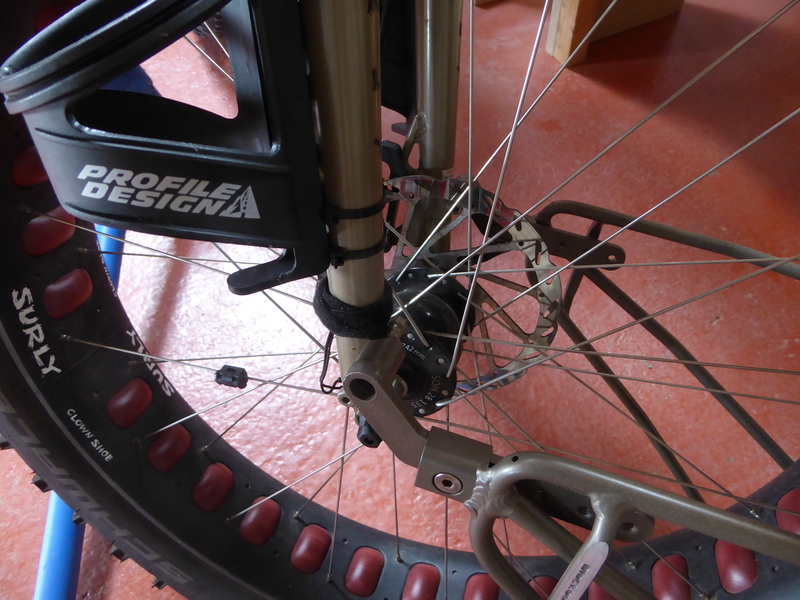 The front wheel is simple and just slots in and it is easy to adjust the brake and connect up the dynamo. The rear wheel is a different story. 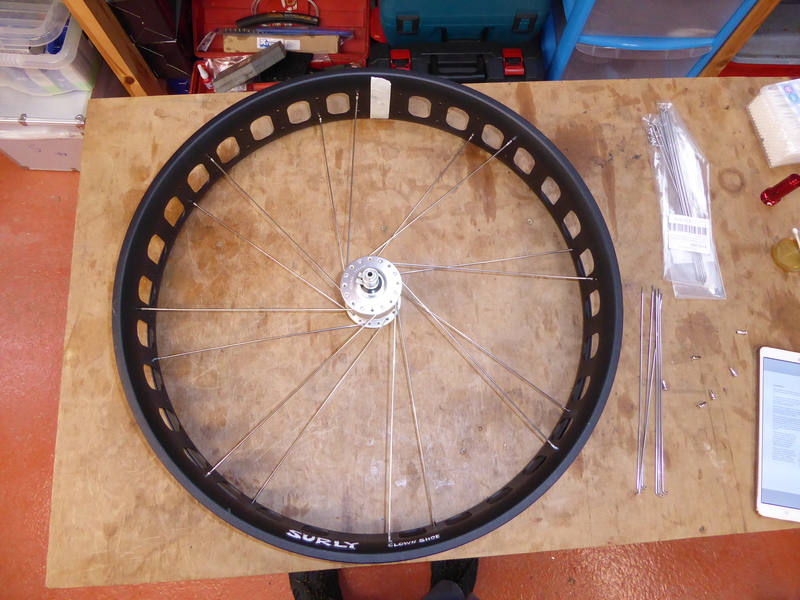 Before setting out on this build I contacted Surly and asked for a list of the frames that will take the Rohloff Hub. Moonlander was among those offered. 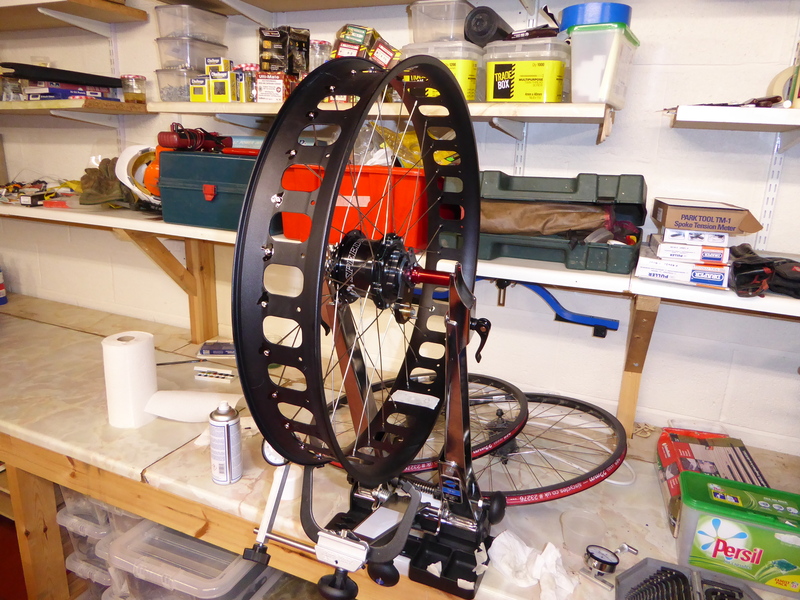 There is a blog on their site showing the Rohloff in a frame mounted using the Rohloff Speedbone as the torsion device. So I started with this and soon found that whilst it is possible there is such limited movement 4-5 mm of movement that it would not allow me to adjust the wheel position very far as the chain wore out. It also made removing the wheel to fix a puncture only possible by removing the brake caliper. So I put the Speedbone in the spares box and fitted the torsion bar to the chain stay using the fittings supplied in the OEM2 kit. Because of the offset rear chain stay on this side it meant putting a slight bend in the torsion bar. DO NOT DO THIS! The torsion bar only has strength in the vertical plane. me + bike + full load 26 kg = 120 kg up a steep hill caused the torsion bar to bend so far it rubbed on the disc. (see our Scottish Isles Blog). On return I cut an aluminium block 50 mm x 25 mm x 12 mm, drilled it with two 10 mm holes so it would fit the Rohloff torsion bar mounting at the Speed Hub end. 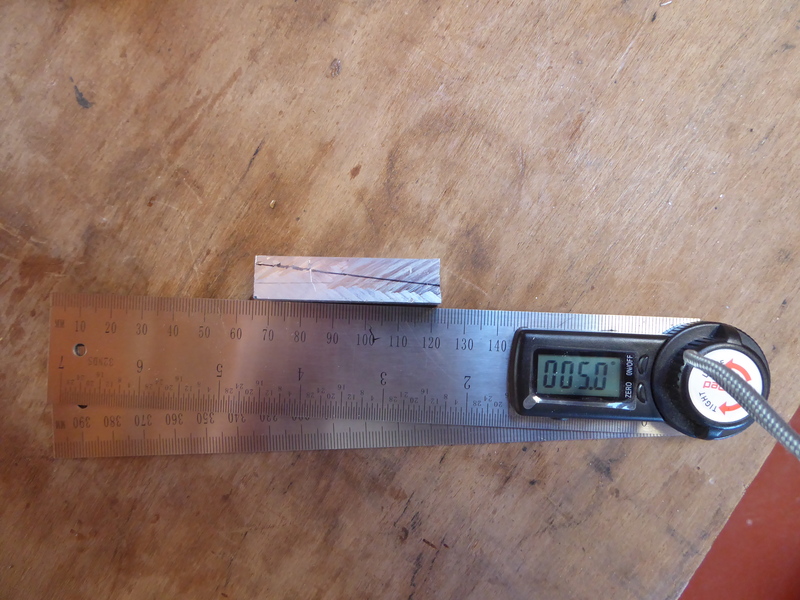 Then cut it in half along the 12 mm thickness at 5 degree angle. Purchased two high tensile 8 mm bolts with 0.5 mm pitch thread from SJS Cycles part No 31332 and cut to length. I also bought a length of 10 mm aluminium tube wall thickness 1 mm from amazon to make the spacers so there was no slack round the bolts. Sandwiching the torsion bar between these allows it all to line up with out any bend. This was the hardest but not the only problem caused by the frame design. There are in a bicycle with disc brakes on the chain side under power very high forces pulling the wheel forward and on the brake side under braking very high forces pulling the wheel backwards. To stop the chain side movement fit the Surly tugnut. But there is no equivalent for the brake side. The torsion bar on the Rohloff can do this but only if you can secure it sufficiently well to the chain stay. The torsion bar and fitting were not designed to do this job. The chain stay is tapered toward the rear so the rearward force pulls the jubilee clips to the thinner part if the tube and any stabilizing effect is lost. 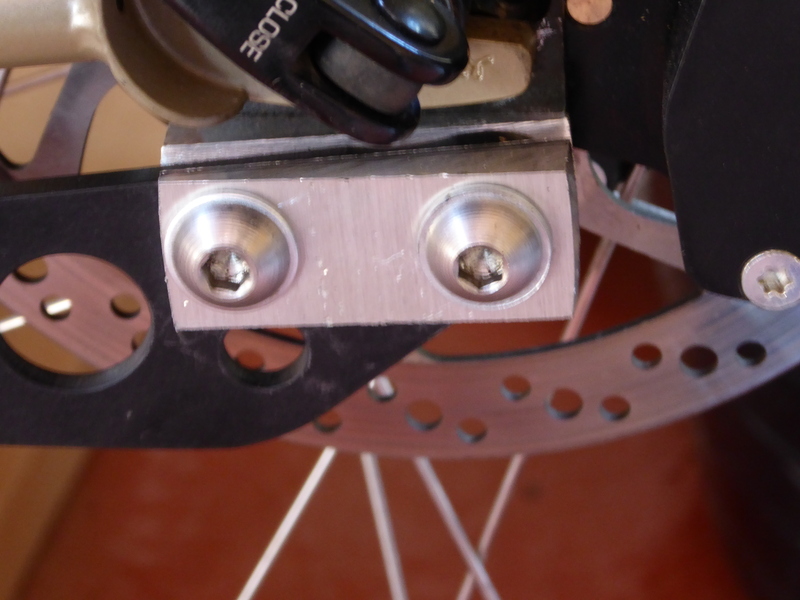 I could not get enough grip with the clips provided by Rohloff so I replaced them with heavier good quality ones (see picture above) which allowed me to get enough grip to stop the rear wheel skewing in the frame under heavy braking. They are 22 mm – 30 mm x 14 mm Jubilee Clips. 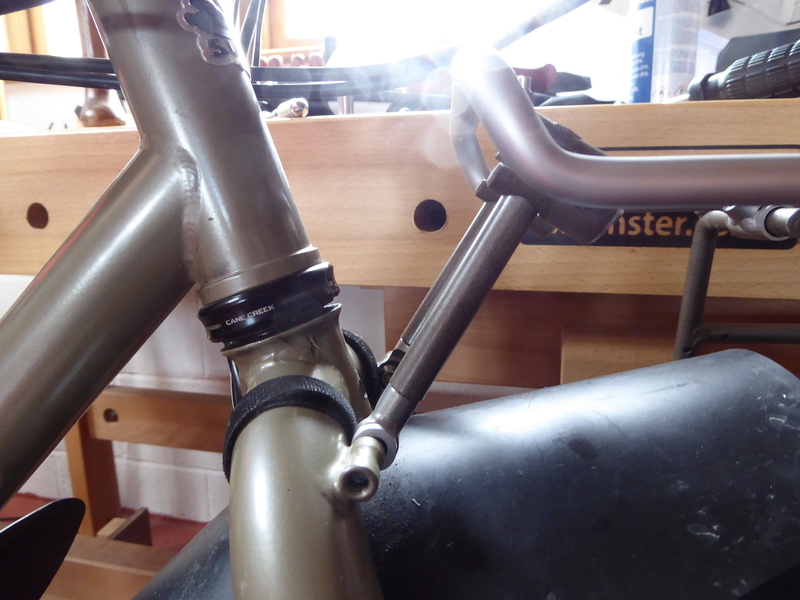 I have to say that in my opinion the eccentric bottom bracket is a much better way to design a frame for this type of use. Sarah and I are really pleased with our new bikes and looking forward to doing a really long tour on gravel and dirt roads. 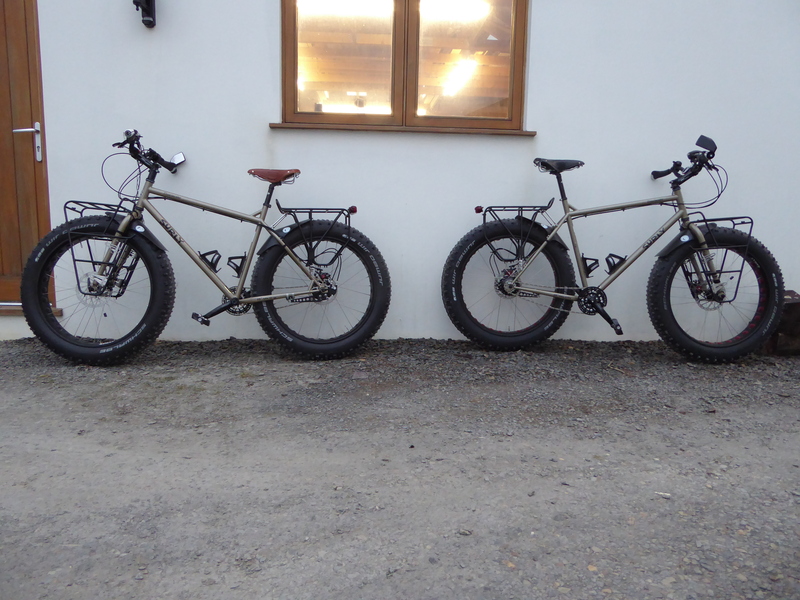 The finished bikes on our first Fatbike tour in the Scottish isles. On the Strand between Colonsay and Oransay. The finished bikes weigh 20 kg without luggage. Our Thorns were 18.5 kg. We are both in our sixties we like to wild camp and enjoy the great outdoors. But we do not see why we should suffer privation to do it. Over the few years we have been touring we have refined a set of equipment which will deal with almost any situation but is also some of the lightest in it’s class. Our Thorn XXP bikes have front suspension and suspension seat posts and so we tour with rear panniers + rack bags + 6l Front bags all made by Ortleib. This puts almost all the weight on the back. The Thorn design with extra long rear chain stays minimizes the problem this causes. But it is still hard to keep the front wheel on the ground up steep hills especially off road. 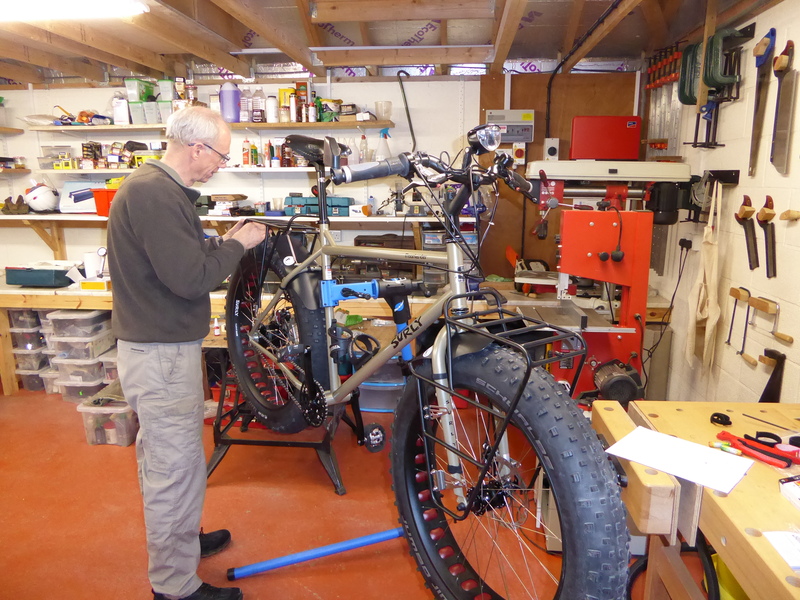 The Fat Tyres mean we do not need suspension or suspension seat posts so we can have front racks and balance the weight between the front and rear which makes the bikes more stable on steep climbs as it is much easier to keep the front wheel on the ground. We looked at bike packing set ups and realized that we wished to still take the same equipment which was possible but taking the stuff on and off the bikes would be much more difficult and we would end up with much more awkward shaped bags to carry into the occasional hotel or B&B. Also the handle bar bags and seat bags put the weight much higher on the frame which is bad for handling. So we opted for 4 Ortleib panniers on Surly racks. The only bike pack bag we have is a medium Gas Tank from Revelate for cameras and wallet. We have used the bikes on a mixture of tarmac, gravel roads and knarly single track and find them very stable and easy to handle. 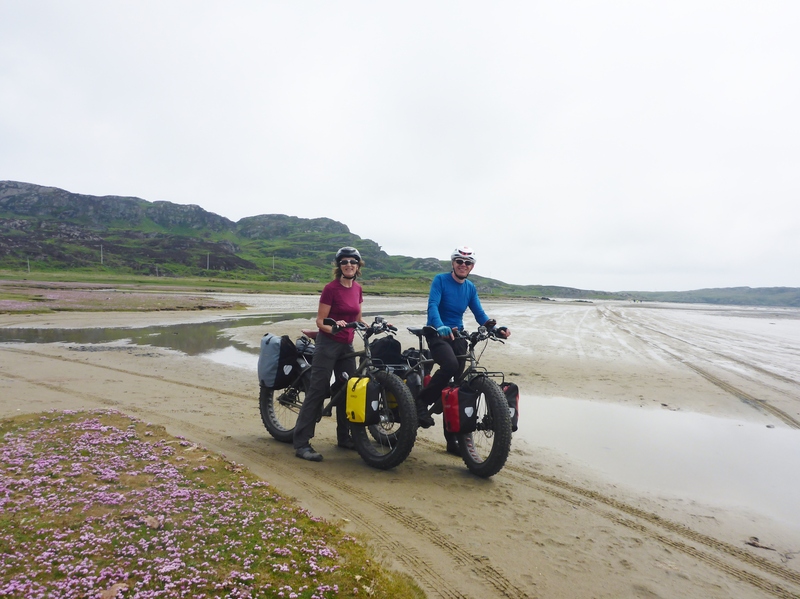 We never race anywhere, typically cycling 60 to 90 km a day stopping often and enjoying places and the people we meet. After releasing my blog one of the comments was that I should look at the Blackburn Outpost Fat Bike rack for the front as it would allow me to use bottle holders on the front forks for extra water. 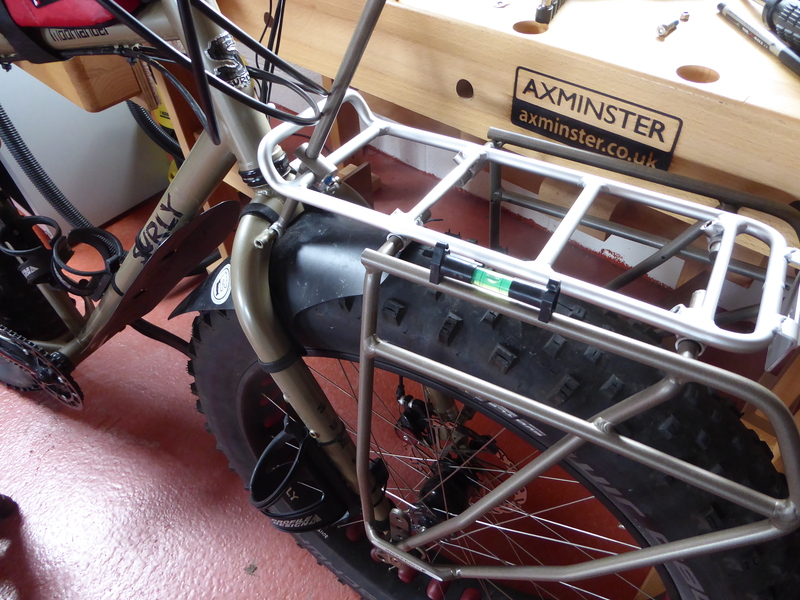 I originally thought that these racks could only be fitted using the front skewer axle but I was wrong. I have bought and fitted these racks to both our Moonlanders. They do allow me to fit bottle cages to the front fork and they move the front panniers forward and up to allow this. They fit well to the frame lugs on the Moonlander. The racks have so many fitting options that it was difficult to decide which is best. When in doubt I always go for simplicity. Fit one the two main side pieces securing it to the lower frame lug on the fork using the 5 mm screw with the knurled head. 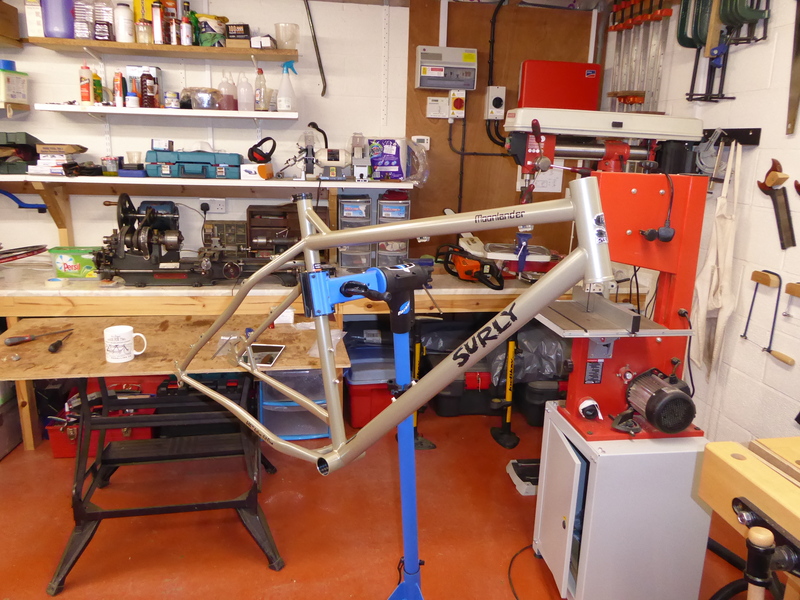 Fit the silver top rack loosely in place then fit the other side frame securing in the same way. 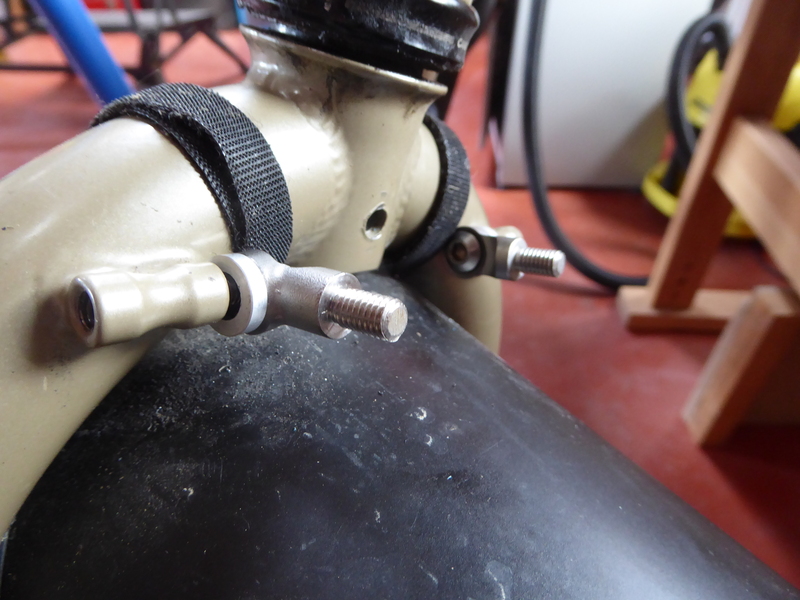 unscrew the dished lugs from the bar ends and fix them to the inside of the top fork lugs using the 5 mm screws with the curved heads and the curved washer (see photo) be careful not to cross thread the screws as you start them space is tight. I found screwing the first couple of turns using fingers worked, screw in most of the way. Then take the rod and the U shaped boss and slide the boss over the rear rack cross bar, ( I found having the screws facing down gave the cleanest finish) then slide the bar through and screw into the bar end lugs you have just put on the fork. Use a level to get the rack flat and mark the bar ready to cut to length. 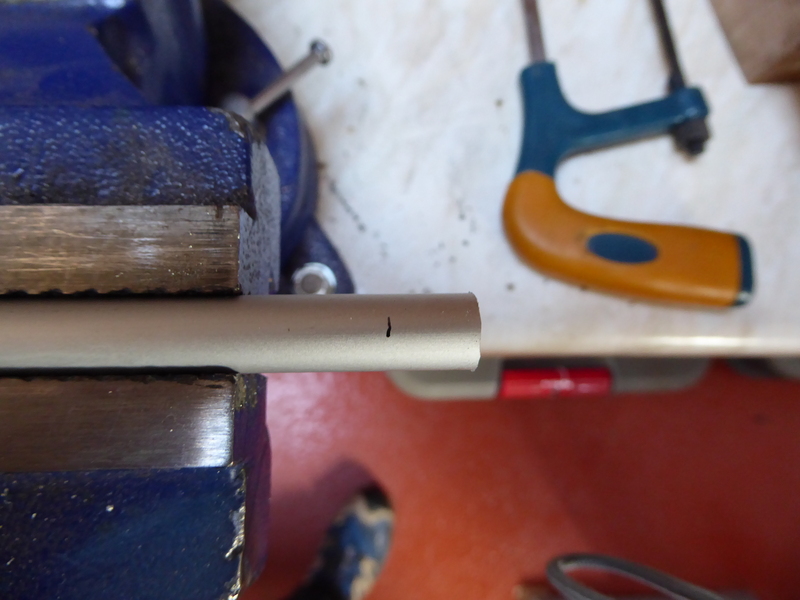 remove the bars again, hacksaw, clean the ends with a file then fit. Adjust the main rack bed so it is central, ensure the main length of the side frames are vertical and tighten the 4 screws on the rack bed. then tighten the screws on the U shaped bosses and then the 5 mm screws in the top fork lugs then last the screws in fork bottom lugs. These Blackburn racks are designed to fit either front or rear. 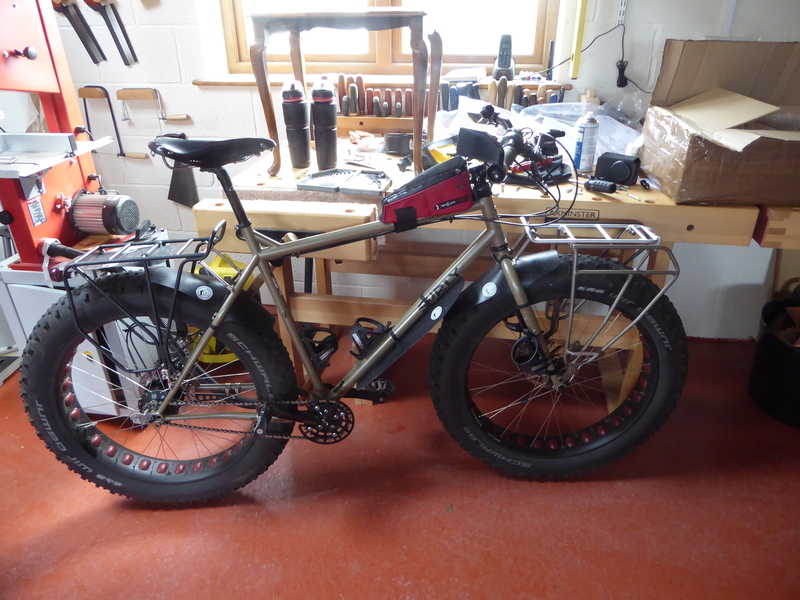 If they were also fitted to the rear I think they would give a little extra heal room when compared to the Surly rear rack but I’m not sure if I could manage to bend the aluminium Blackburn racks as easily as the steel Surly racks to compensate for the rear axle offset. I can see no advantage for me to change the rear racks so the Surly racks will stay. Rohloff Torsion Bar. Since fitting the 5 degree block to the rear of the torsion bar on the Rohloff I have ridden a number of very steep hills including one rocky climb when I had 30 kg of load and I am happy to be able to say the torsion bar is still as straight as the day I fitted it! We are now just looking forward to being able to take enough time out to cycle the west side of South America – Columbia to Terra del Fuego. Thanks for the blog entry. Turns out the Blackburn Outpost rack has to be mounted the same way on the front of the Surly ECR. Photos helped me get it right on my install.